Even though we are under a fresh blanket of snow… the calendar assures us that spring is, in fact, actually HERE. Okay. I’m just going to have to take their word on that. 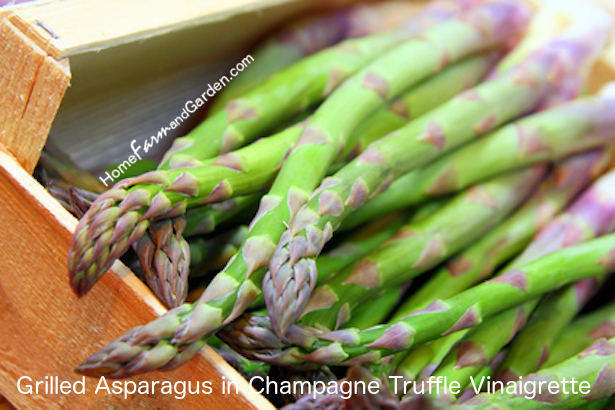 🙂 To help you keep the faith that spring is truly on the way – I thought I’d share this quick recipe for one of my favorite harbingers of spring – fresh asparagus. This light and easy side dish is great in warmer weather. It pairs well with just about any main meat dish you can imagine, including steak, chicken, or pork chops. I like it with with very lightly seasoned cedar-plank salmon. Combine 1 tablespoon extra virgin olive oil, Champagne vinegar, truffle oil, and fresh lemon juice in a salad dressing shaker. If you don’t have one, whisk the ingredients together in a glass bowl until thoroughly combined. If desired, add salt and pepper to taste. Lightly brush the asparagus spears with remaining olive oil. Heat large grill pan over medium-high heat and add the asparagus. Cook just until crisp-tender, about 3 minutes. The grill pan will impart darkened grill lines; Do not overcook. Remove asparagus from pan and toss with vinaigrette in a glass bowl until coated evenly. Serve cool with a squeeze of fresh lemon. Season with additional salt and pepper, if desired. Thanks for stopping by! If you liked this recipe, please share on Facebook, Twitter or Pinterest. You can also sign up below to receive weekly recipes and tips right in your inbox!